We Pinoys are very talented. But somehow, some don't just make the break. Or maybe talent isn't just what everyone needs. I guess one would need luck and the right opportunity. 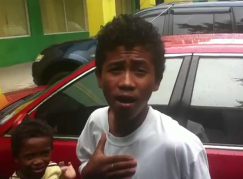 This kid has been selling flutes in Pampanga, and to sell flutes, he sings for people. It is common in the Philippines children helping out their parents in earning money to sustain the family. I don't know the whole story. I'm not even sure if he still goes to school or is he eating right every day. All I know is this kid got potential. His name is Arjohn Gilbert. When he sings, you forget he is an Aeta and he speaks tagalog. You might even think he could be the next Michael Jackson, although he sings Justin Bieber songs...better than any kid I've seen. Question is, why bother to sell flutes when he's got something much more interesting? No, I don't have the answers, and apparently, no one does. Interestingly, Aljohn has been featured in different TV shows as a documentary, and this was in 2009. Its 2011, and he was recently seen performing in Puregold Pampanga in the parking space...still with the flutes. He still has the really good voice though. Watch the video. He's got something going on there. But hey, this is the Philippines. He got media coverage already two years back and he is still in the streets. What a waste of talent. I wrote this partially to help Arjohn in my own small way, but the bigger part is that this is what's happening here. Lots of things get unnoticed, unappreciated and unattended. Here's a kid who got his 15 minutes of fame and that's just how long it lasted. Maybe this time, he gets more noticed. More of The Pinoy Warrior!